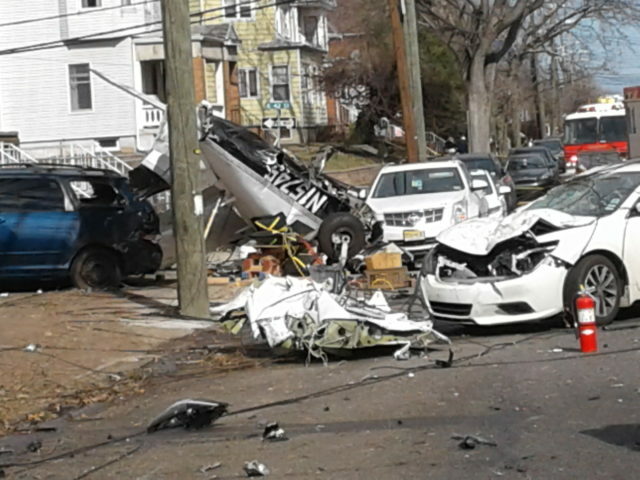 The Piper PA-28 singe-engine plane that crashed on Sunday, February 19th, 2017 on Bayonne’s Avenue E is now being investigated by the National Transportation Safety Board. The many parts of the downed plane that spread over the 2 block area between 40th and 42nd street in Bayonne have been collected for examination and the investigation has begun on what caused the single -engine plane to crash. The pilot Geroge Pettaway 56, of Wheatley Heights, Long Island recuperating in Jersey City’s Medical Center is scheduled to be released on Wednesday, February 22nd. The crash occurred after Pettaway began experiencing problems with the plane near the Statue of Liberty and had hoped to land the small plane in New Jersey then crashing on Avenue E.
Pettaway’s plane landed upside down not before hitting power lines, and damaging four cars.